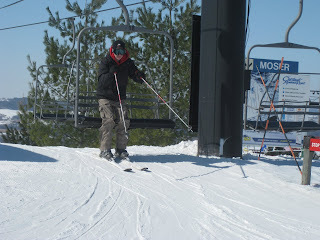 We finally took advantage of cold, snowy, Northern Illinois yesterday and went skiing. We had the place to ourselves. No lines at the lifts. A weekday package for $30 that included rentals, a 2 hour lesson, and all day lift tickets. And yes, I participated and had fun. 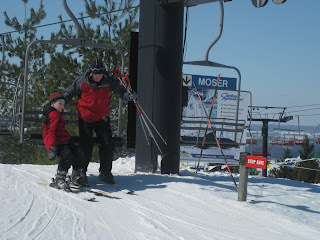 This was our first skiing attempt and it went really well. Chance took off and tackled the bigger runs after a few times down the beginner slope. Finn and I stayed on " Rookies Ridge" but he still got out there and tried it. Today we are tired, sore, and have sunburned faces. But we had so much fun we're going back next season. Maybe we'll out try snowboarding next year? 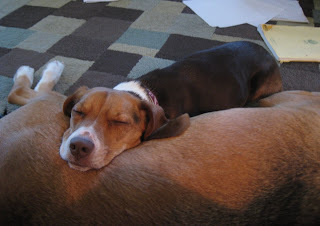 Things are so much more peaceful around here when the babies, I mean dogs, are sleeping. I have one big dog who loves to tear things apart. (This morning it was a new bar of soap). I have one little dog who likes to ingest anything tore up by the big dog. They are perfect for each other. The Olympics are halfway through. I was cruising right along on the Haruni pattern until my yarn ran out. 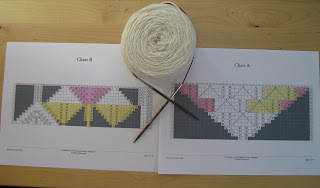 I ordered some more yarn this morning which means I will now rip back to the first chart, add some more repeats, then continue to the second chart and edging. It doesn't look good for me being able to finish this project by the closing ceremonies. With all this Olympic spirit I decided to have the kids track the medals and countries. 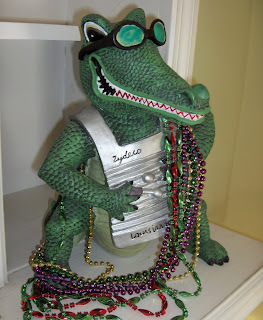 It's very homemade but it's still fun to see who is leading in the medal count. 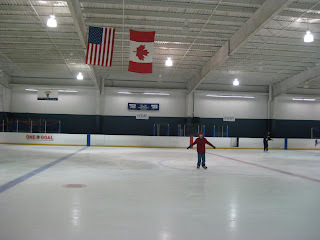 On Thursday I took the kid's ice skating. It was their first time ever trying out this sport and they've already asked to go back and try it again. It really helped them appreciate the Olympic skating events even more. 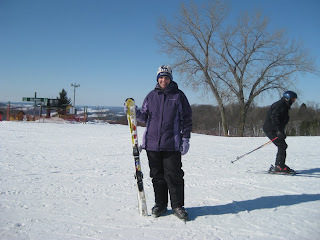 Up next this coming week---our first ever attempt at skiing and snowboarding. Those crazy knitters who pick a project, cast on during the Opening ceremonies, and complete the knitting during the next 17 days of the Olympic games. I was there(via internet) to cast on during the 2006 games in Italy. Wow I can't believe I've been knitting for 4 years now. This time around I have my yarn(Dream in Color Starry) and pattern(Haruni shawl)ready. What do you plan on knitting during these Olympic games? There are a couple of other new things in our lives this semester. The eldest child is taking a "Mock Trial" class with other home schooled teens. "The trial is an actual murder case that happened in South Carolina. The students will become the prosecution and defense for the accused. The case will be presented in a real courtroom in front of a real judge." It will be fun to see them present the case at the end of the semester in the county courthouse. The youngest child started singing a few weeks ago with a Children's choir. The instructor is super enthusiastic about teaching choir. Our house is now filled with lots of singing along with piano playing. I love it! 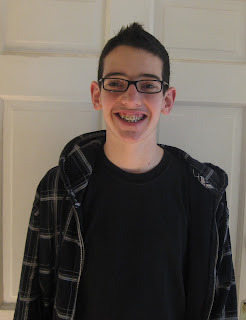 One last new thing for the New Year-eldest son had braces put on his teeth. Something else to cause him to be even more cranky. Fantastic!